This year's 29th edition featured a nail-biting match-up between the defending champion Benita Johnson from Australia and 2005 winner and course record-holder (15:18) Asmae Leghzaoui from Morocco. Neither woman had shown much in the way of world-class form so far this year, and the Ethiopians were more highly tipped, but no one could trade strides with Johnson and Leghzaoui once the real racing got under way. The gun sent 3,123 women on their way, with a knot of world-class runners at the forefront, led by 25-year-old Rose Kosgei from Kenya. Others included Mara Yamauchi (GBR), Emily Chebet (KEN), Teyba Erkesso, plus Leghzaoui and Johnson. Kosgei did not hold the lead for long. Leghzaoui surged to the forefront before 2km and began to open daylight. While others immediately lost ground Johnson closed down the gap just as relentlessly as the Moroccan had opened it. At 3km they were side by side. The course record holder fought hard, but Johnson's strength was undeniable. The Australian increased the tempo with brutal efficiency. In the closing 400m, Johnson took 10 seconds out of Leghzaoui to clip five seconds from her winning time of last year and record the third fastest winning time. "I only felt that I was going to win with about 800m to go. When I saw the gap opening, I went harder" said Johnson. Leghzaoui was satisfied with her second place: "Here it is hot and very humid," she said. "I am happy. This is my first big race of the year." AIMS' newest member, announced just a week before the race was held, welcomed its runners with sunny, warm weather and a fresh wind. Only two days before the event most runners would have been extremely nervous, if not in shock, because for the previous 10 days the Moscow region had broken all records for seasonal temperature highs. 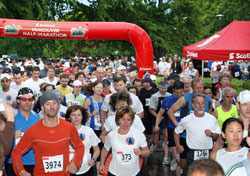 But they were not put off: the event attracted 1400 runners from 37 regions of Russia and from 12 countries of the world. Half of them chose the half marathon distance, others preferred the shorter distances offered. 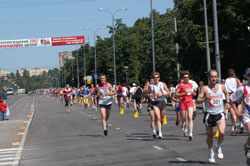 The half marathon course was of three equal laps through the streets of Zelenograd. The town is part of the Russian capital, but it was established as a separate city only 50 years ago, in a wooded area 20km from Greater Moscow. One-third of it is still covered by forest parks. Both the men's and women's winners emerged early in their respective races, after the first lap: Alina Ivanova (personal best in marathon 2:25.32) and Sergey Lukin (personal best in marathon 2:10.57). They held their positions right through to the finish, and were not seriously contested. The race is sponsored by the Ecuadorian capital's evening newspaper, founded 70 years ago, and the latest news was that the Peruvian runner Paulino Canchaya surprised everyone in the last kilometre of the race. He pounced upon the longtime leader, Kenya's Lazarus Nyakeranka, to secure a clear win. Defending champion Franklin Tenorio could manage only third place this year. Colombia also scored victory in the women's race, as Martha Roncerla succeeded Martha Tenorio as champion. Altogether 8000 people completed this race, locals and foreigners, run at 2800m above sea level up in the high Andes and just a few kilometres south of the equator. The race began on Avenida Maldonado, where the main office of Ultimas Noticia is located, on the south side of the city. The course traversed the old centre of the city and finished on the north side, in the Atahualpa Stadium. The 29th edition was marked by extremely hot weather, blue skies and 29°C at the 14.00 race start. Zimbabwe's Philip Bandawe defended his title, but he was so exhausted that he could hardly speak after his victory. He surged away from Jonah Kemboi during the last 10km and won by 400m. The top women handled the conditions better than the men. The tough Norwegian Kirsten Melkevik Oppenbu, who trains more than 300km/week, outpaced last year's winner, local girl Anna Rahm, by almost two minutes. It was the second hottest ever Stockholm Marathon, and not a day for personal bests. 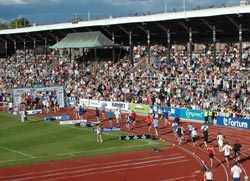 Although the organisers offered everyone a free start in next year's Stockholm Marathon if they didn't feel prepared to struggle in the appalling conditions, 14,139 runners started the race. Nearly all of the 12,435 finishers looked good when they reached the finish line at the 1912 Olympic Stadium. Nearly all the 1,884 dropouts conceded at the end of the first lap, after 20km. The medical staff had a surprisingly easy day. Only eight runners had to be taken into hospital: one with a fractured foot, and seven with dehydration. The event was established following the Tsunami disaster in 2004. Organisers set out to create a celebration of how the people, businesses, and landscape of Thailand had recovered and were moving forward. In only in its second year, the race saw nearly a doubling of participation, with 3,868 runners taking part in all races, including the Half Marathon, 10km Fun Run and 5km Walk. The event has developed its own fun and friendly personality that the entire island can enjoy. "Ecomarathon" advocate Hajime Nishi took part in the marathon while Andy Penders and Charlie Webster from ESPN STAR Sports participated in the 5km walk and the Half Marathon, respectively. Runners were encouraged to raise money for the race's official charity HOPE worldwide (Thailand), which is dedicated to helping needy children and underprivileged girls in Thailand. Patrick Nthiwa missed the start but stormed his way past a record field of over 4,000 to set a new course record of 63:10 writes Alan Brookes. 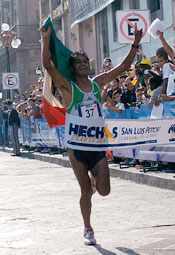 He beat Moroccan Mustapha Bennacer's 2003 mark by a mere four seconds. Fellow Kenyan Magdalene Mukunzi had a less-dramatic come-from-behind win as she blew past Canada's top-ranked marathoner and Calgary's Lisa Harvey around 12km, before cruising to a comfortable victory. Harvey was delighted with her second place, almost a minute and a half ahead of Lioudmila Kortchguina, who had a miserable day in the rain after Harvey had been an ignominious 17 minutes behind her at the Ottawa Marathon a month before. The men started out with a fast, downhill kilometre before a group of five — Kenyan Joshua Kemei, Toronto's Danny Kassap and Giitah Macharia, Ottawa's Joseph Nsengiyumva and Nanaimo's Steve Osaduik — settled down to a steady pace. They passed 5km in 14:50, by which time Osaduik had slipped off the back. 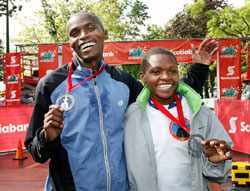 Nsengiyumva was next to drop, at 6km, and Macharia fell back after the ninth kilometre was clicked off in 2:55. Kassap continued to push, passing 10km in 29:24 after a 2:38 on the big downhill to Spanish Banks, with Kemei tucked in behind. Nthiwa then emerged, running hard from 10-13km along the flat stretch of Spanish Banks right next to the Pacific Ocean with the snow-capped North Shore Mountains in the background. He dramatically caught the two leaders at the end of this stretch on the stiff uphill slope to West 4th Avenue, just before 14km. Continuing his relentless pursuit-pace, he ran 2:59 and 2:58 for the next 2km. Kemei dropped fast; Kassap held on only until 16km. By this time, the drizzle had turned to light rain, and then to a deluge. Alone, in pouring rain, Nthiwa battled the elements and the clock, chasing the extra $1,000 course record bonus. Coming down off the majestic Burrard Bridge, he hammered out 2:56 and 2:54 for the 20th and 21st kilometres, to cross the finish line in Stanley park with just four seconds to spare. Despite the rain, there were smiles: a record sized field, the new course record, and a new fundraising record in excess of a quarter of a million dollars for six local charities. The sun even appeared as astonishingly as the downpour, to brighten up the awards proceedings and the bedraggled volunteer crews. More than 10,000 runners participated in the Rio de Janeiro City Marathon and its associated Half Marathon and 6km Family Run. It was a beautiful sunny day, and more than 500 foreign runners were able to appreciate the occasion. Former Olympic Champion Rosa Mota also attended, and saw an exciting contest between two Brazilian runners already qualified for the 2007 Pan-American Games at the end of July. Both male and female winners received the biggest prize ever paid in this sort of competition in Brazil. 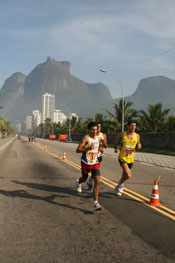 The Marathon started at Recreio Beach and ran through all of Rio's famous beaches. The Half Marathon started at Barra Beach, on the marathon course, and both finished at Flamengo Beach, in a beautiful park, where the Family 6km Run also took place. All races started at the same time so that the Family Run competitors waited for the Half Marathon runners, and both together they awaited the marathon runners on the common finish line. The women's Half Marathon contest was intense, between Sirlene Pinho and Marcia Narloch, who were both qualified for 2007 Pan-American Games, and were using the half marathon as part of their Games build-up. From the start they alternated the lead but in the end, Pinho won by just less than 100m. Rosa Mota was the 6km Family run race patron, and she also participated. 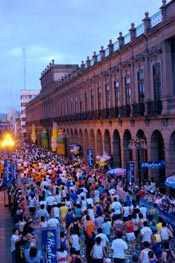 In the Plaza de los Fundadores, 24 hours before the main event, 5000 children aged between 5-11 waited for their own race start, just as the marathon runners were to do the following day. Each of them gave their all in striving towards the finish line, while their parents proudly looked on. The gunshot rent the air at 06.50 as wheelchair and paralympic categories started their race. Ten minutes later the 2500-strong main field set off, guided by the lead vehicle with race organisers, international observers and Mexican Federation officials in attendance. Conditions were good with the start temperature at around 10°C. Spectators screamed encouragement at runners, who are treated as heroes on this day as they run through the picturesque 400-year old city of San Luis Potosi. A group of Kenyans led the race, but at 30km Edilberto Mendez started to forge ahead, and went on to record his first ever marathon win. The Tangamanga Marathon has historically generated winners who then progress to become national champions. New records were set in both categories over the AIMS-certified course as Adriana Sanchez recorded a time of 2:37:37. All runners received a craft-designed medal in the shape of a shoe with the Tangamanaga Marathon logo and the City shield. Through AIMS membership, the race has heavily promoted itself in foreign markets, and as a result was pleased to welcome tourist runners from the USA, Canada, Argentina, Korea and Japan. Tanagamanga is benefiting by sharing the culture and friendship of the world running community. We invite you all to come and run in Mexico. 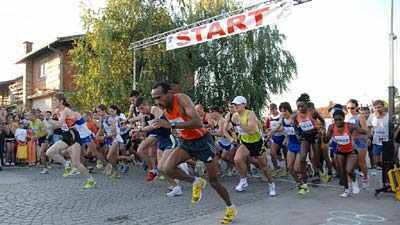 On a warm sunny evening thousands of people crammed into the triangular park in the centre of the small town of Brcko which is surrounded by the race lap. 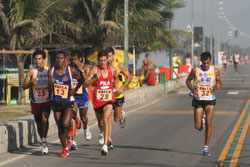 After a series of 10 children's races about 250 runners in the title 10km event started off on their journey of 11 laps. At the front of the field a group of eight pulled away on the first lap. Two laps later it was down to five, and Tewodros Shiferaw, already dictating the pace, soon drew away to run the rest of the race in splendid isolation, coming home 22 seconds under the previous course record. It took Olivera Jevtic even less time to stamp her considerable authority on the women's race, even though she missed her own course record by a single second. She ran a remarkably even paced race, completing each 920m lap consistently in 2:59. Cathy Mutwa gave early chase to her but had to back off after two laps, and was caught by Lucija Kimani - a fellow Kenyan by birth, but a Bosnian by marriage. She was in turn caught late on in the race by Serbia's Ana Subotic.